Raahgiri is promoting sustainable, active transport in India’s capital. Photo by Raahgiri Day, New Delhi/Facebook. Delhi’s government just announced a week of Independence Day celebrations culminating in a Raahgiri event at Chandni Chowk. Raahgiri Day first came to Delhi in July as a weekly event that closes city streets to cars to celebrate walking, biking, music-making and socializing. This Raahgiri event will take place on India’s 68th Independence Day across from the Red Fort – a UNESCO World Heritage Site – and will also include activities like skating, zumba, yoga, and cycling. On the morning of Independence Day, the Delhi government will offer free bus rides to take people to the Red Fort, outside of the car-free zone. Raahgiri Day took a huge leap forward when it spread from Gurgaon, the 800,000 person city where it began in November 2013, to Delhi, the world’s second most populous city. Over 5,000 people attended Delhi’s first Raahgiri Day in Connaught Place, located in the heart of the city. In its third week, attendance doubled to more than 10,000. Organizers say that the event is becoming the city’s hotspot on Sundays. In Gurgaon, a recent survey conducted by EMBARQ India found that Raahgiri day has had a positive impact on everything from non-motorized transport usage to road safety, greater engagement between local businesses and the community, and increased physical activity. Further, average particulate matter readings on Raahgiri Sunday’s were about half as high as the typical weekday. Raahgiri Day is already capturing public imagination in Gurgaon and Delhi. 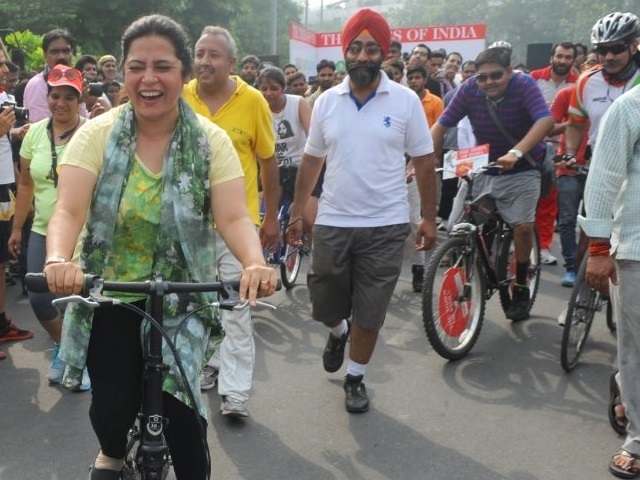 The decision to place Raahgiri Day at the center of Independence Day celebrations shows Delhi’s desire to integrate the principals of sustainable, active mobility into the city’s culture.